Miso is a traditional Japanese seasoning made by fermenting soybeans together with salt and fungus and sometimes barley and rice. Used in soup stocks to make miso soup, it is also used to pickle vegetables and meat, used in sauces and a many other dishes. It is full of vitamins, protein, and fiber and plays an important role in the Japanese diet. 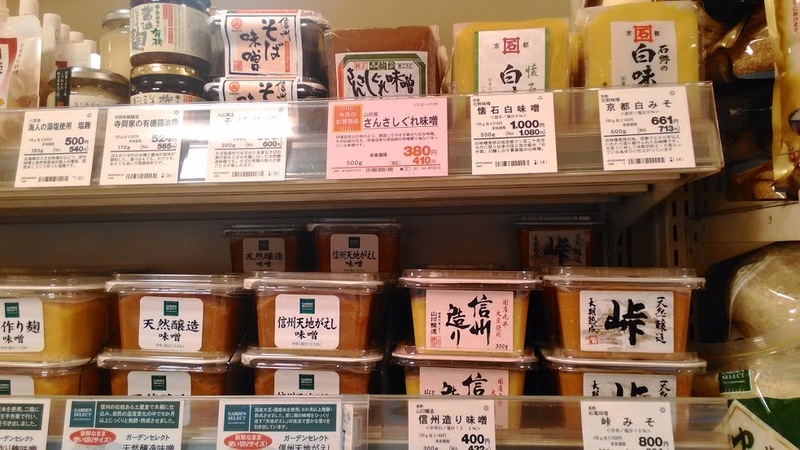 If you go to a supermarket you will see a wide range of miso (which looks like peanut butter, but it's not)! Even the average Japanese wouldn't know what it all tastes like. In general, the longer the miso is fermented, the more saltier it gets. So if you prefer a strong taste miso, you should get a red color miso. If you prefer a light flavored sweeter miso, you should get the white miso. The light color miso is in between as it is represented by the famous Shinshu Miso (信州みそ) and it is actually brown in color. Like wine, each region has their own type of miso. Rice Miso(Kome-miso:米味噌) - Most popular type of miso, consumed nation wide. It comes in various colors. Barley Miso(Mugi-miso:麦みそ) - Accounts for 11% of total production. White Barley Miso is produced in Kyushu, Shikoku, and Chugoku region. Red Barley Miso is producted in North Kanto Region. Bean Miso(Mame-miso:豆味噌) - Represented by Haccho-Miso(八丁味噌) it has a dark reddish color. Mainly produced around Aichi, Gifu and Mie Prefecture. It has a bitter taste and strong umami flavor. Mixed Miso(Chougo-miso:調合味噌) - A blend of various types of miso. Once opened miso must be covered and stored in the refrigerator or freezer. The miso will turn darker in color as time goes by as it continues to ferment. You can still consume it, but if it has lost it's aroma, you can use it in stir fries instead of using it in miso soups as long as it is within the expiration date. On the top right corner - the white miso from Kyoto which has a sweet taste. Bottom, the popular Shinshu Miso. 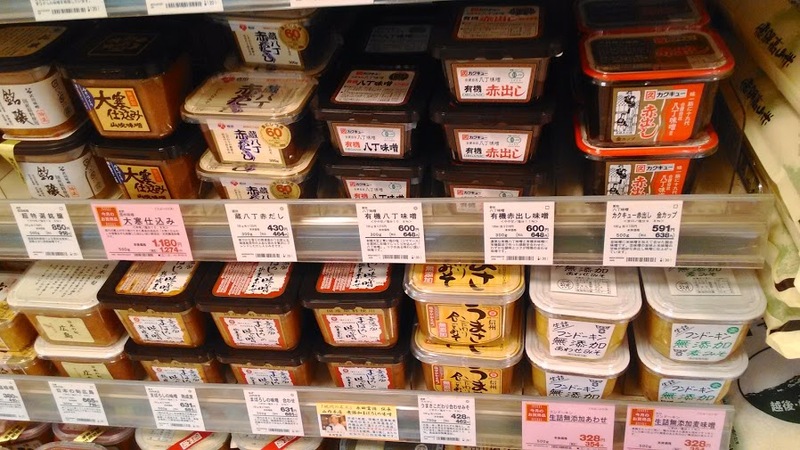 The darker color miso on the upper shelf is the red miso, strong in flavor and saltier than the yellowish color and brown miso. 1. Finely chop green, tear the nori in bite size pieces and cut the tofu in cubes. 2. Heat the dashi to boil, add tofu. Bring back to boil and simmer on low heat. 3. Add the miso in the ladle and mix until the miso has dissolved. Remove from heat. 4. Garnish with the green onions, top with nori and serve. Make sure you do not keep on boiling the soup as the miso will lose its flavor and aroma.